I know it’s sometimes challenging to figure out which compliment/complement to use but this is a rather old shop and I’d expect they’d want to get this right. ‘Complimentary’ is right as they’re giving away a pair of earrings but ‘compliment’ is wrong as the earrings are not giving away nice sayings. They really want ‘complement’ as it will go nicely with any pearls. I loved this number plate the other night. The lighting is not so good as it’s night time but you’re getting it anyway. It reminds me of my friend in Queensland whose Twitter handle was similar to this. 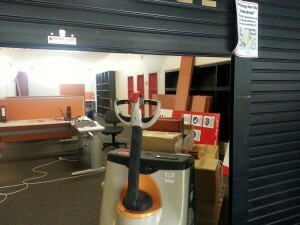 I knew the DUSA (Deakin University Students Association) Bookshop had moved recently but didn’t know where from. This is in the DUSA building and just happened to be open one day. A man came up and spoke to me as I was looking in so I asked if I could take a photo for my blog. Nice to actually get permission and even nicer that he promptly moved out of my phone’s line of sight. You might have noticed I don’t put many photos of people here.